You Are Here: Home → Puerto Rico 3, Dominican Republic 1: Puerto Rico Ends Dominican Republic’s 11-Game Win Streak in W.B.C. Puerto Rico 3, Dominican Republic 1: Puerto Rico Ends Dominican Republic’s 11-Game Win Streak in W.B.C. Yadier Molina, center, with his Puerto Rican teammates after hitting a home run in the sixth inning against the Dominican Republic on Tuesday. 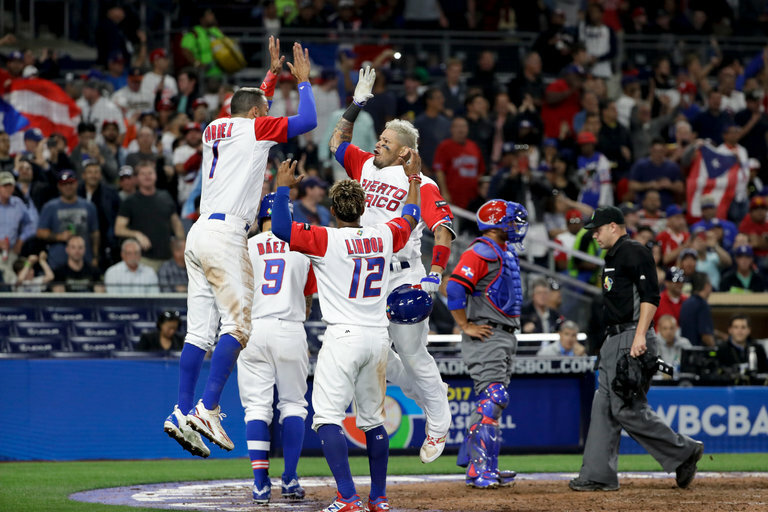 SAN DIEGO — Yadier Molina homered and hit a run-scoring single to lead Puerto Rico to a 3-1 victory against the Dominican Republic in the second round of the World Baseball Classic on Tuesday. Eddie Rosario doubled to score a run in the fourth to put Puerto Rico ahead and threw out a runner at the plate, helping to end the Dominicans’ 11-game winning streak in the W.B.C. It was a rematch of the 2013 W.B.C. title game, which the Dominicans won 3-0 at AT&T Park in San Francisco. The Puerto Ricans were exuberant during the win at Petco Park. After Rosario, the right fielder, threw out Jean Segura at the plate with a one-hopper to Molina to end the top of the first, pitcher Orlando Román jumped in the air while Molina punched the air in celebration. Rosario’s teammates converged and chest-bumped him so hard he fell down. Toronto Maple Leafs-Boston Bruins Game 7: Who reaches next round of NHL playoffs?